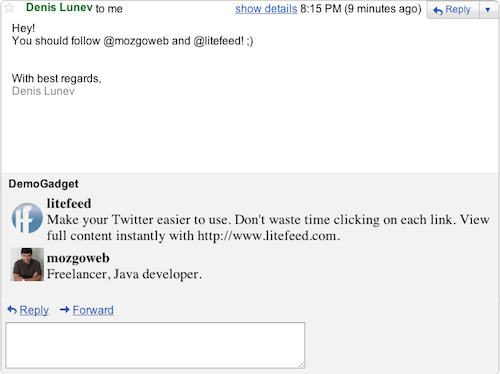 Today we’ll create Gmail Contextual gadget with the help of GWT. Gmail Contextual gadgets can work only with Google Apps for domain, you can’t set it up with your *@gmail.com account, because gadgets are available via Google Apps Marketplace only. I take only Body Extractor, you can add any other. * Twitter functionality based on "Cross-Site Scripting with GWT and Twitter"
Card view is required for Contextual gadgets. Now you need to upload builded gadgets (all files from folder, where located CtxGadgetEntryPoint.gadget.xml) to FTP or any other web storage, which we specified in Manifest. Fill “Application Manifest” with content from our Manifest.xml. So, you’ve created application, now we need to connect it to domain. Hit “Add it now” button and write your domain, then login with your domain admin credentials and activate application. Thats all! Open any email and see how it works. Remember, that gadgets have very solid cache and it can take some time for your changes to be accepted, even with ?nogadgetcache=1 parameter. My sample application searches words, starting with “@” in email body and shows twitter info for these users. 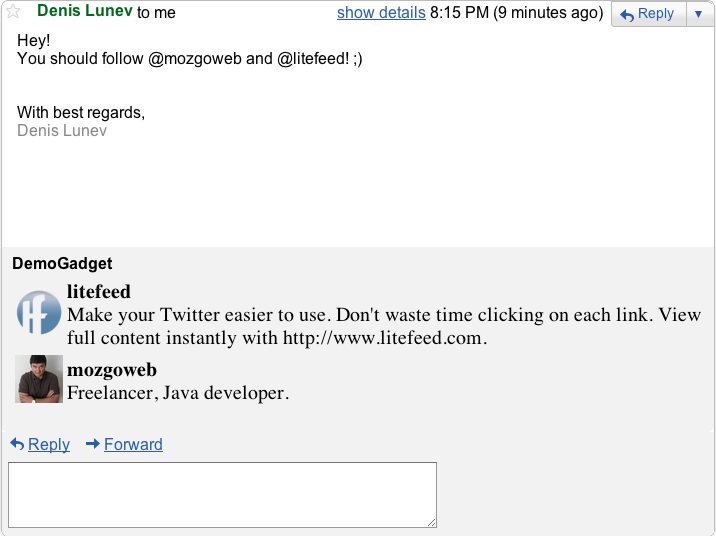 I used Twitter + GWT example by Alex Moffat for this Demo Gadget. You can find source code here. Posted in Uncategorized. Tagged with gadget, GWT, Java.